In 2014, I was in Glasgow for the Scottish referendum. I had spent the day before the referendum out and about in Glasgow and the “Yes” for independence vote was out in force, and as such I got a very different impression about which way the vote might go based solely on what I saw “on the ground.” The same thing happened last night. As I observed Londoners yesterday 8 out of every 10 stickers I saw people wearing were “In,” and I told more than one friend before I went to bed that I thought the Remain camp had just edged it, 52-48. It turns out I was right about the margin, but wrong about the winner. It’s the morning of a shocking result for everyone, even those unabashedly “Leave” like myself. Many of us have never had a political result go “our way” in our lifetimes. During the campaign those of us who wanted to Leave were told we were racists, isolationists, and economic naïfs. If only we were smart enough to trust the so-called experts (who had warned what would happen to the UK economy if it didn’t join the euro). I had already lost interest in answering these accusations and in a way, I had already moved on. Whatever way the vote went, I was happy that the arguments had been made, for both sides, and I was wearied by the long campaign. Frankly, I wasn’t prepared for Leave to win, and perhaps neither were the official Leave campaign. Boris Johnson was said to have told someone going home on the Tube last night that he thought Leave had lost. As I woke up to dozens of overnight texts and emails from the U.S., who had watched Sky call it for Out early in the morning UK time, I was anxious to get to find out reaction from the populace itself and set out for a coffee shop in Central London to get a sense of the mood. I watched two clearly very close friends who often get coffee together quickly decide, after a terse and quickly escalated exchange, that they were just going to discuss other things (the Remain lady was more upset and tried to find her solace in some sudoku). The Korean War veteran I managed to speak with for a few minutes shared with me an unpleasant conversation he had had with David Cameron earlier in the year at a British Legion event at which he told the PM what for. But I knew these views were just a small part of the bigger story, and a coffee shop would only give me a steady drip of opinion, whereas I was ready for the firehose of freewheeling interviews with politicians across from Westminster on College Green. I headed over with a friend I had met for coffee, a fellow Brexite(e)r, and went to look upon the media fracas. It was really a great opportunity to engage with both the people who had made a compelling case during the referendum – I met people like Peter Bone, Jacob Rees-Mogg, Mark Reckless, Daniel Hannan, and the like who had been calmly putting forth the Euroskeptic case for years. I spoke with curious Americans and Aussies and Kiwis who had come out, curious, to see what was going on — many of them not really acquainted with the arguments of either side of the debate. I also talked with some of the more reasonable Remainers, who had come out to put their understandable “what happens now” questions to some of the MPs and MEPs in question. Most of them, including a Ph.D. Candidate at the LSE, were willing to admit that it wasn’t so much that Britain was done for economically – they knew that there were no tariffs going up tomorrow or even 5 years from now on the most important goods and services in the UK economy, and readily admitted that this would be a huge rebirth of the fishing industry in the UK – they were more concerned about the optics of the event: did Britain look racist to the rest of the world? They certainly felt that way – and to be fair to them, there are ugly elements within the Leave camp who stand guilty of those charges. But from my experience, both with the British people, and in observing this referendum which I knew was coming once UKIP won the European elections in 2014, those small and ugly voices are simply not an engaged majority who will influence governance. Common sense will prevail, as will mutual self-interest. Perhaps that’s the sunny and optimistic American in me, but that’s because I was born and spent the first decade of my life in a country that left the UK and went on to thrive (Singapore) so it’s very believable to me that the UK could leave the EU and go on to thrive too. I stayed for a couple hours and many of the media were on “Boris standby” in the hopes that the boy-man with the messy hair would show up and say a few words. He would have been absolutely mobbed on this mixed zone in which no one was checking press credentials (I and some friends casually strolled in after watching proceedings for an hour) and where prank comedians were busy trying to embarrass politicians by asking why we couldn’t “send all the plumbers home now.” I picked a favorite noodle shop on the South Bank and took in the sunshine and enjoyed lunch where I still couldn’t really believe it had happened. Alex Salmond led a campaign for “Yes” in Scotland 2 years ago that was an optimistic and hope-filled one that I heartily supported. What many Remainers should know today is that there are many Leavers who are just as optimistic and hope-filled, not just because we don’t see the EU as synonymous with Europe, but because there are so many options available to everyone, not just the UK, now that Fortress Europe has been breached. We aren’t racist, we aren’t hateful, and we know that the only way for the UK to move forward is for the new government to take account of the 48 percent of those who “respectfully disagreed” and create a roadmap for the UK that inspires everyone, both inside and outside it. 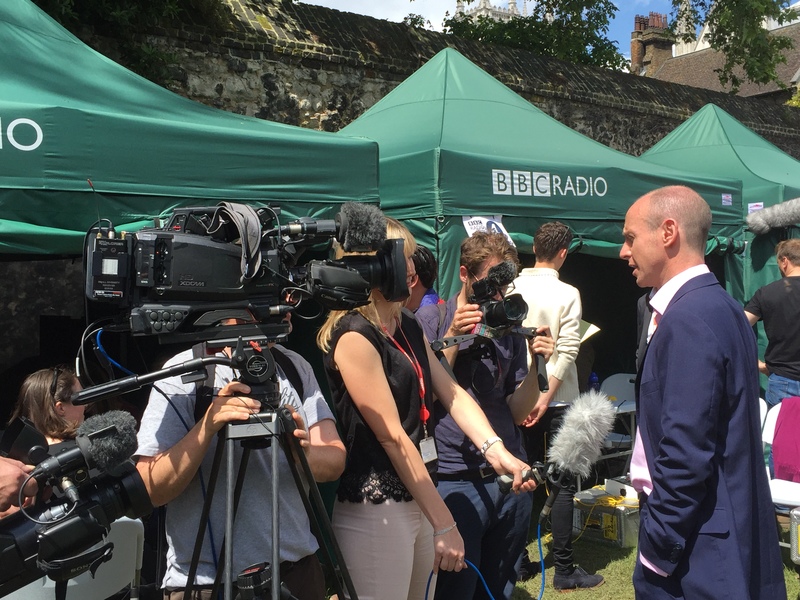 Picture taken this morning of an interview of MEP Daniel Hannan, who in helping to lead the Leave campaign, just voted himself out of a job in the European Parliament. You’re looking a turkey who voted for Christmas. We could use a few more politicians like him.